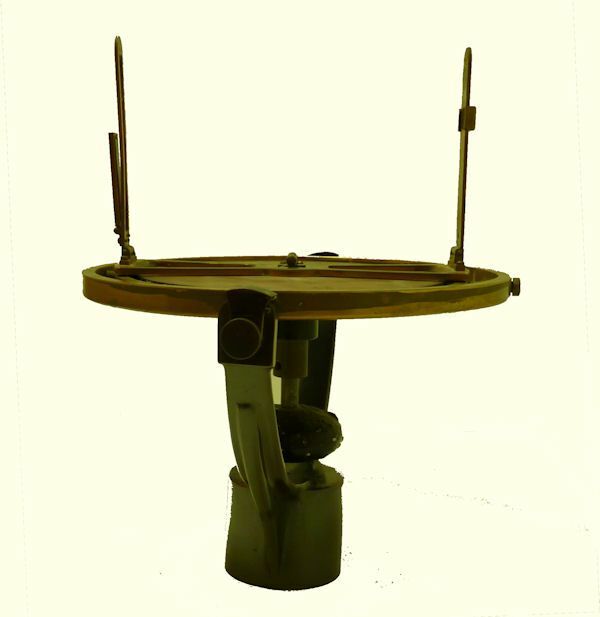 To view our current inventory of binnacles, compasses telegraphs and other bridge instruments, click here! This Old Relic Has Been Sold. Thank you! The word pelorus comes from the name of the guide who directed Hannibal's army from Carthage to Rome in 218 B.C. This example consists of a compass rose with North in the form of a simple arrow with tail as the zero indicator. The outer ring is enumerated with bold numbers every 30 degrees with intermediate hash marks every 5 degrees which is further subdivided in 1 degree increments. On the inner circle, the cardinal points have directional coordinates "lettered", N, S, E, & W. that are further subdivided by NE, SE, SW, NW markings which divides the circle into 32 points, each of 11 1/4 degrees. 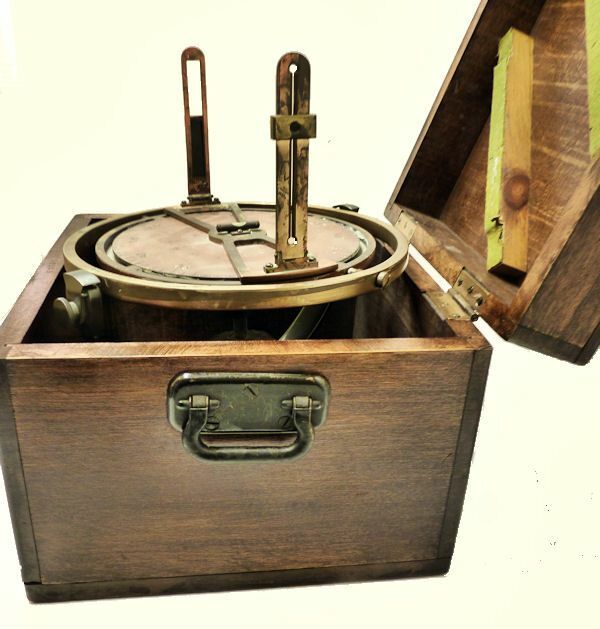 The bronze compass rose is set inside a bronze ring on gimbals with a heavy lead weight below so that it remains level during the ships movements. There are two sighting vanes which move together. The viewer's vane has a sun shade attached. The forward vane had a hairline thread which is missing that is lined up on the body. It also has a filter to reduce the brightness of the sun when taking amplitude sights. 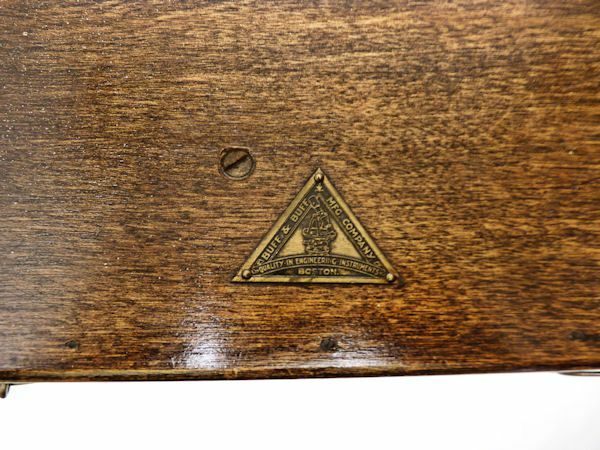 It is designed to be used when mounted on a pipe stand on the bridge wings or may be used while in its wood case. The two sighting vanes are aimed at a terrestrial object with the bearing read off the compass card. 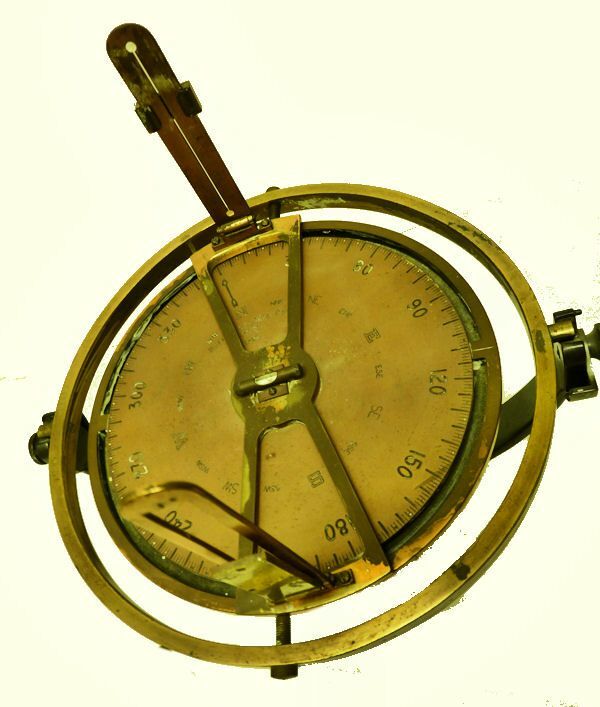 These bearings are simultaneously compared to the vessel's compass heading which then gives the compass bearing to the object. Appropriate adjustment is made for compass error. Bearings of two objects, taken sequentially, will fix the vessel's position. Similar observations of a rising or setting sun when on the prime vertical allow for determining compass error. 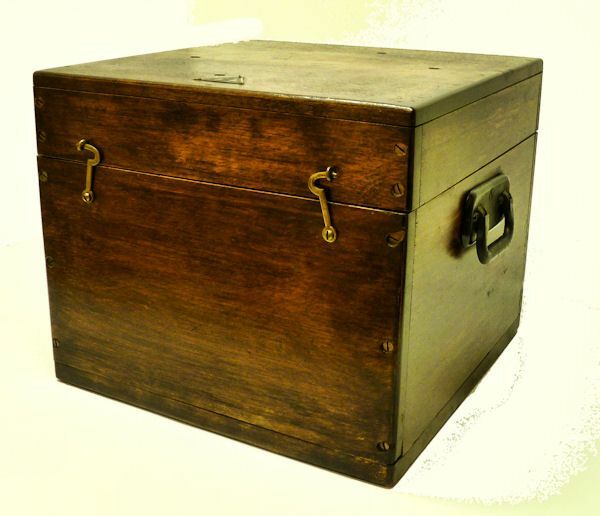 CONDITION: Except for some minor stains on the case and some of the minor blemishes, it is in very good condition. The pelorus shows use at sea, but is complete and usable. A sighing thread in the front vane is missing. There is a level at the center point of the dial. BUFF & BUFF MANUFACTURING COMPANY was started by George Louis Buff in 1898 with his son, Louis, after the elder Buff's dissolution of his previous business Buff & Berger. 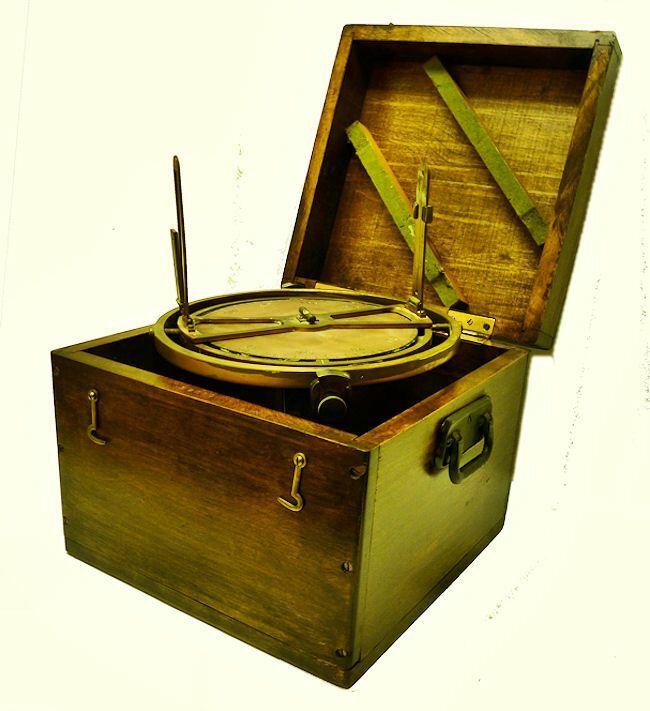 They were a manufacturer of precision engineering instruments, primarily surveying transits and theodolites, but during the course of WW I and WW II manufacture navigation instruments, including sextants for the Navy. In various forms, they survived until around 1980 when they went out of business. 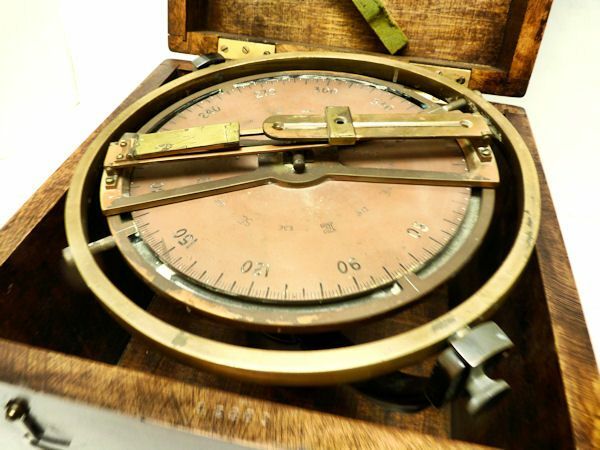 Here is a piece of old seagoing gear in good condition. It is a good selection for any collection or for use it at sea. OUR UNCONDITIONAL NO NONSENSE GUARANTEE: If not completely satisfied with your purchase it may be returned within five days of receipt in its original packaging if without damage. Return items must be insured for their full value. Only a prior email authorization from us for the return is required. Shipping charges are included in this offer within the continetal United Sates if an error is due to our fault.